Inkpot Monkey is three-fourths of the great Wilmington, NC, post-punk prog band Pandora’s Lunchbox, formed (renamed, really) upon the departure from PL of guitarist Shane Drew. Kenyata, co-founder of the legendary DIY music festival WE Fest, and a central figure in the cassette underground throughout the nineties, sent me this tape to clue me in to the band’s latest direction. 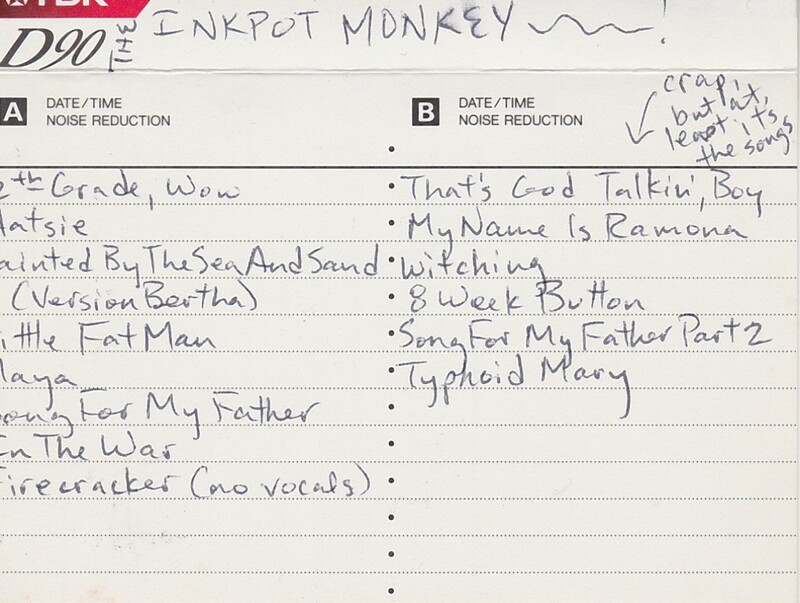 The title is mine; the j-card itself is simply labeled “Inkpot Monkey~!” Most of the tracks here are works in progress; some have never been heard by anyone outside the band’s inner circle until today. According to Kenyata, whom I called to get the skinny, this may be one of the only copies of this cassette in existence. How about that! Inkpot Monkey later evolved into The Majestic Twelve, which remained active through most of the last decade. These days, Kenyata runs Whatever Wilmington, a “modern day pop culture and curiosity shoppe.” Peter Gottovi is a teacher in Costa Rica. Dunno what Jack is up to. Here’s a video of Pandora’s Lunchbox live. Dig it!